If you caught Taylor Swift when she was at the Greensboro Coliseum or saw Luke Bryan’s half-time show during the Panthers versus Cowboys Thanksgiving game, you’ve seen Jacob Durham’s handiwork. Or – more to the point – heard it. 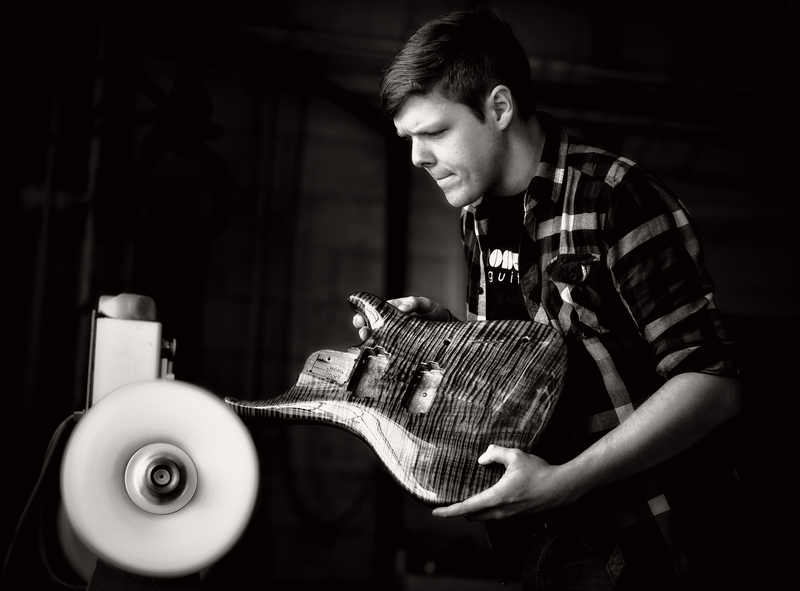 Jacob, 27, builds guitars for Roscoe Guitars, located in Greensboro since 1972. Roscoe Guitars manufactures premium bass guitars that are sold around the world. You can find them at BadAxe Boutique here in Greensboro. Models range from $2,500 to however much you’re willing to spend on customization. One of the basses Jacob carved, by hand, was played by a bassist for Luke Bryan’s band last year. Another one was played by Amos Heller during Taylor Swift’s 1989 tour. The most expensive was one he made for Nenê Hilario of the Washington Wizards, coming in at close to $13,500. Jacob got his affection for the guitar when he was only 6 years old. His dad bought him a jumbo-sized acoustic guitar, one he could barely wrap his arms around, and he hasn’t stopped playing since. He’s played classical guitar at Weaver Academy, taken part in productions with the American Hebrew Academy Theater, played in ensembles with UNCG and been a member of random cover bands that have toured in the area. The transition to crafting guitars came when a former coworker told Jacob about a position to do electronics at Roscoe Guitars on North Spring Street in Greensboro. The shop is owned by founder Keith Roscoe, who turned his interest in repairing and restoring guitars into one of the country’s first full-blown guitar repair shops in the 70s. The next morning Jacob rushed to the store and spent an hour and a half trying to convince owner Keith Roscoe that he was right for the job. Keith was sold, and Jacob got the job. His ambition paid off as he quickly learned the craft, which started with installing and repairing guitar electronics. Today, Jacob does the body shaping, wood processing, cutting, electronics, fretting installations and more with Roscoe’s team of five. It takes about five weeks to finish one bass. It’s a long process because of the time, precision, love and care. “Every single bass we look at every square centimeter that it’s up to our standards before it goes out,” says Jacob, who is also currently studying for a math and computer science degree at UNCG. “Most of our customers know that they’re making a big investment ‘cause it’s the kind of thing that you keep for the rest of your life,” Jacob says.